Cut a 64 inch path up to 26 inches high with our PTO powered snow blower. 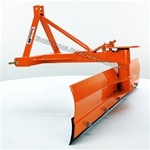 Snow removal will be quick and simple once you mount this snow blower on your 3 point hitch. Adjustable skid shoes prevent gouging with diamond shaped adjustment holes for use with carriage bolts, while the 15" diameter auger with 3/8" thick flighting powers through the snow. The chute rotates a full 360 degrees and features an adjustable top deflector. 64" Tractor PTO Powered Snowblower by Everything Attachments. This snowblower can be powered by 18-30 HP at the PTO shaft. Free shipping within 1,000 miles! Meets all my expectations. Since its July I cant give it the final test. Seems well made and heavy duty.